Construction workers were emptying out a popular pizzeria on Austin Street today. 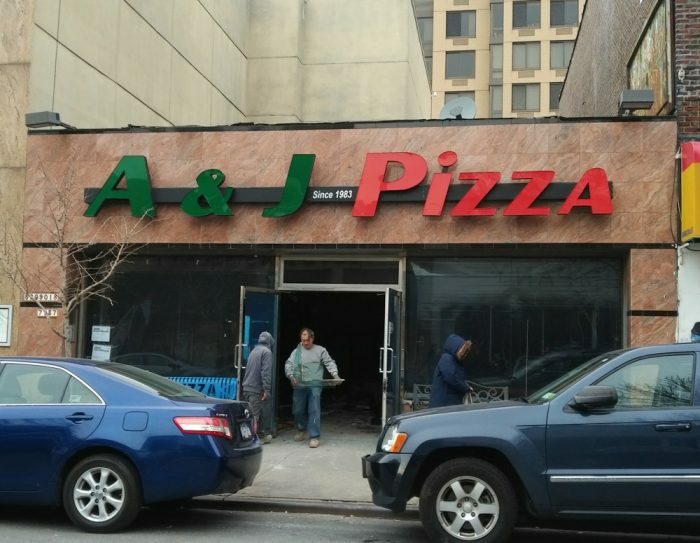 A&J Pizza, which has been located at 71-37 Austin St. for nearly four decades, has closed, with construction workers gutting the location and throwing its contents into a dumpster. A poster is plastered on the pizzeria’s window that notes the store was repossessed by the landlord, dated Jan. 14. The owner of the eatery could not be reached for comment. The pizzeria is located in an odd-shaped building that once housed the dry-cleaning store Maryfield Cleaners at 107-10 71st Rd. The drycleaner, which had been located on 71st Road for 18 years, moved after an agreement could not be reached with the landlord as to the rent. The property was listed for sale in July 2018 for $9.8 million. The property hasn’t been sold based on city records. I worked in Forest Hills for 10 years. Used to go to A & J every week and then would always visit and stop by for a slice. I think the new owners were fine. Add this to the list. Hopefully Nicks Pizza is still there ! Until the business changed hands, I always liked A&J by the slice. Once it sold, the quality was gone in no time. Gloria’s has been consistent since the day it opened: consistently garbage! There is nowhere to get a slice on Austin street at this point. Sadly, there are no more NY-Italians to open pizza joints. No interest. Like East European Jews opening delis or bakeries…a lost world, my friends. Not saying Ecuadorians or Bolivians can’t make Italian pizza (NY style), but they have to be trained.Otherwise…crapola. The problem is that the building owners can afford to leave the stores empty and are constantly looking for long term “A” tenants. That’s why there are so many banks on Austin and Continental. It has hurt the real estate prices. Ask any of the real estate agents. A few restaurants on Metro which is nice but not the convenience of Austin. Been eating pizza in FH forever, I’m 43 and always have lived here. I agree with David, when the new owners took over, this place turned into the drizzling shits. Add in the guy in the kangol behind the counter who ignored men to help women and had an attitude problem, I say good riddance. Let’s make one thing certain, however, there no longer is any decent pizza in FH. Lillian’s was sold and their crust became crap. Avellino always tries to slide in bad math on you for extra money. Due Fratelli was opened, the original owners made great pizza and made it cheap so they drove the place across QB out and then they sold, the new owners make crap pizza. Primadonna became nasty years ago, 108th has nothing of taste. It’s no longer a pizza neighborhood. For the record, Sorisi was never good, it was just open late and you were probably drunk when you had it, so you thought it was good. Gloria Pizza was good for about ten minutes. Thank God Al Dente and their 30 years of trash pizza is gone, they were a complete disgrace. CALLING ALL ITALIANS: OPEN A GOOD PIZZERIA IN FOREST HILLS AND DON’T BE CHEAP WITH THE INGREDIENTS AND THEY WILL COME! Due Fratelli has good pizza – it’s not oily and they have good hero’s – the bread isn’t heavy. Better to pick up your order because delivery is slow. The empty stores aren’t on downtown Flushing. The politicians got a $90,000 grant for small store owners. What is really going on here is the sale, rent gouging, demolition and destruction of our once beautiful neighborhood. Where and when will it end. Probably never. Landlords won’t be getting less greedy anytime soon; our representatives aren’t going to miraculously start caring about our neighborhood’s plight; and the people aren’t likely to begin to take the politicians to task who allow this abomination to continue. We need reporters to expose the reality of what’s going on and we need to wake up! Is Amazon to blame, because I hear Bezos makes a mean slice ? The good news is that Lillian’s Pizza in Forest Hills is still family owned and Now Delivers! Well here comes another “affordable, boutique condo” albeit oddly shaped. One of the reasons I moved to Forest Hills 12 years ago was for all the diverse shops and restaurants. Now, so many storefronts are empty, we lost Barnes & Noble and the area is not thriving like it used to. First Primadonna and now A&J Pizza…ugh. I do have a new favorite pizza place: D’Angelos, 63-27 108th St. They make great pizza and burgers! I am extremely sad to hear this. I loved the place and I have been going there for years. All the people were very nice and the place was always clean. I will truly miss it. It was a great place to go. Me and my sister were regular customers. High rent blight is plaguing many more upscale areas. It has the same effect as the opposite in the 1970s when apt. bldg owners were abandoning their bldgs. because of rent control. There should be a ceiling and floor on rents where everybody can survive and let the market determine the rents in between. It has nothing to do with “high rent blight”; the property is a one-floor taxpayer and will be redeveloped, which is great for the neighborhood. How is tearing down yet another building and putting up more large buildings “great” for the neighborhood? 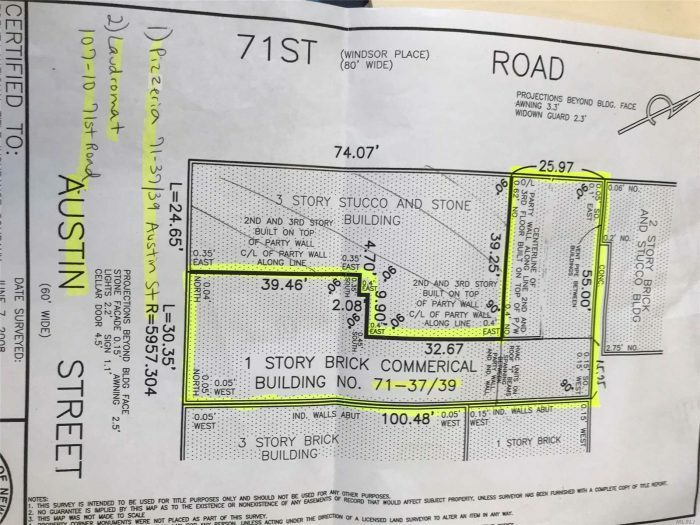 I’ve lived in FH for more than 45 years, and the real estate owners would be happy to turn Austin and Continental into a sterile monolithic block if they could (similar to the western part of Austin). Compare FH to parts of Brooklyn – they have small stores with variety, lots of cool eateries, restaurants, coffee houses, etc. We have crap in FH now. Chain stores, banks, and fast food restaurants. Even better, strip the landlords of the tax break they get for keeping their properties vacant until they get the high rent they want (which can take years). That’ll get the leases renewed or get new tenants in a hurry. as a capitalist as well as newer resident and with all due respect, that sounds stupid. the neighborhood has changed significantly in 40 years, and, while i don’t mind pizza per se, market forces should determine how our neighborhood improves. i for one see many stores on Austin that are ripe for “upgrade”, and every time i walk by i count the days till they get realistic and close down so we can get better stores. let me guess, no one complaining here is also complaining about their property value doubling the last handful of years?? and btw, do you want them double again?? bc I’m sure most of us do. Go on the upper west side of Manhattan and try to find a pizza place, deli or diner. That’s what progress does. It makes it unaffordable for small business. What you will get in your “NEW” stores is chain crap and cheaply made crap. They are going to build up Forest Hills like they have done over by the river in Queens. It’s a concrete jungle with little tiny sterile apartments and little else. Is that what you want? Is it REALLY what you want??? YES Gar that IS REALLY WHAT MOST OF US WANT. Conveniences of major cities like UWS Manhattan. Those things you say are cheaply made are what the majority of the world’s society have voted on with dollars and cents as the best products we want. Thanks. Devastated! I visit my mom from AZ a couple of times a year and always look forward to my NY slice.. bummer. Coming into FH next week. Need to find a new pizza joint. Sorisi’s, Al Dente and now A&Js. All of my childhood pizza places are now closed. Bummer. I grew up with the Family n they sold the name n Pizzeria but still owned the buildings. One of the best Pizza’s n Chicken Park to die for. Used to love the pizza at A & J and then new owner bought it. Pizza was so awful. My husband & I get our pizza at J & D on 63 Road & 99th street. They even make it with a thin crust for us. So, if you wish to have good pizza and they deliver to your area try it. Very sad that this once wonderful pizza place is now gone. But let’s be clear – the economy or competition didn’t lead to A&J’s downfall. Once it was sold a few years ago the new owners ruined the good. What was once delicious pizza was now being made with the shittiest of ingredients and you could absolutely tell. I guess they invested all their profits into that koi pond in the back. Such a shame. 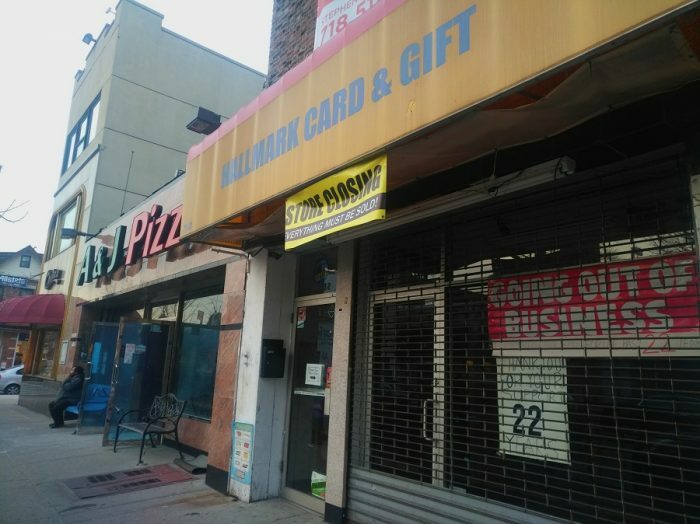 The same thing happened with Primadonna Pizza on Queens Blvd & 67th Ave. New owners and food quality went down. Due Fratelli has good food. On block where Starbucks is on the corner. The new owner never should have bought A & J. The ingredients they were using was garbage. I was surprised it lasted this long. There are no Italian Restaurants, Chinese Restaurants (take out with a few tables). Shocked when Tung Shing clsoed down. I am not a lover of Chinese food other than Hop Kee in China Town but no parking and parking got very expensive. My husband can eat Chinese Food 7 days a week. Loved Joe Abbracciamento Woodhaven Blvd Italian Rest but that whole block is gone. All these buildings being put up but they are staying empty. There will be more Apartment building soon than people. I hope it doesn’t wind up another hole in the ground like further down on Austin. So many empty stores is not good for FH. And the empty stores are everywhere; rents are just not affordable.